Add style to your garden with the Aspects HummZinger Fancy feeder. This feeder is based on the Aspects HummZinger with a few more features. Just like the original HummZinger, this unit has a red cover with four raised flowers creating feeding ports. This prevents rain from running into the bowl. Raised vines and leaves connect the flowers for added interest. The middle of the feeder has a built-in ant cup, preventing insects from contaminating the nectar. The bright red cover contrasts the brass hanger, which has an additional corkscrew to catch the eye. The feeder also includes a brass finial on the bottom of the dish for a finishing touch. The container holds up to twelve ounces of nectar and features a perch ring for your hummingbirds to rest and dine. The cover lifts easily for cleaning and refilling, while the color is sure to catch the birds' eye. The polycarbonate construction will last for several seasons. 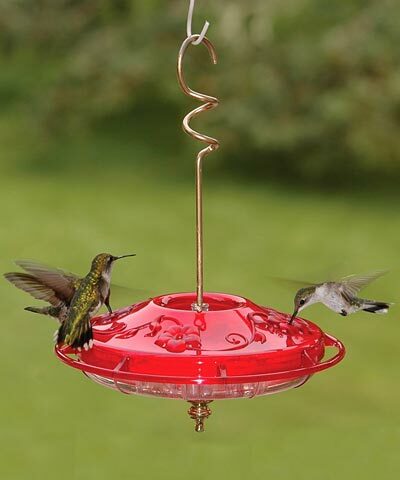 Place the HummZinger Fancy in your yard for an elegant and functional feeder. Made in the USA. Lifetime guarantee.